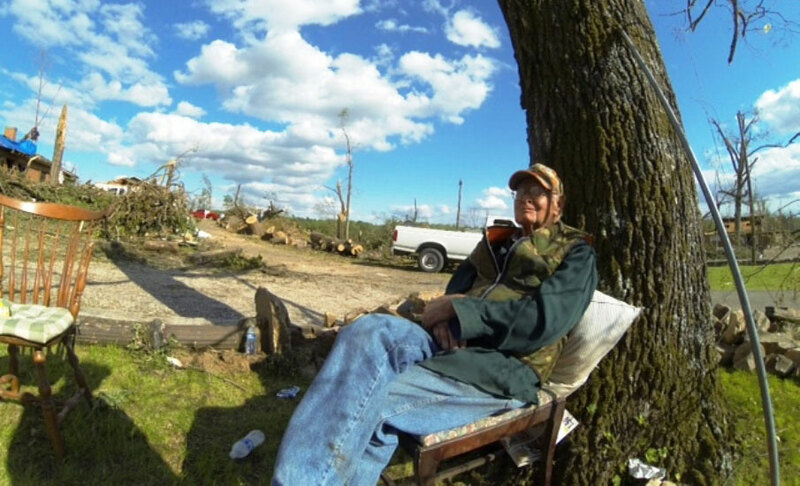 The day after a tornado wiped out Kevin Short’s and his father’s homes, he was ready to take his dad to a casino and put every thing they had left on the roulette wheel. Short may be right. His 87-year old father, Louie Short, had in his words “cheated death” twice in the last two weeks. The first was when the elder Short had fallen in a salvage yard, narrowly missed being impaled on a piece of iron and escaping with nine stiches to his head. The second is much more dramatic. The tornadoes that ripped through the country on April 27, racking up almost three-dozen deaths, started their early rampage in Arkansas. During its course of terror and its aftermath, Kevin Short would see two more instances where Louie Short would seem incredibly lucky. When the storms started, Kevin and his wife, Kerry, were sitting in their RV on the shores of Toledo Bend in Louisiana. Short was set to begin practice for the Evan Williams Bourbon Bassmaster Elite Series tournament the next day. But as they watched the Weather Channel, fishing was the furthest thing from their mind. Short got on the phone with his dad, who lives two houses down from him. Both situated on the banks of Lake Conway in Mayflower, Ark. “I told him, ‘I don't know where you are, I don't know what you're doing but you better get your damn helmet on and get in the corner because it's about to be there,’’ Short said. His father took his advice as Short watched on television while the storm made a beeline for his home. “After it passed, I called, really fearing the worst. At first I couldn’t get hold of him because all the lines were down, and when I did I could hear in his voice that it wasn’t good. That’s exactly what they did, leaving their RV and bass boat on the shores of Toledo Bend. Short drove straight to the hospital where his father was being treated for cuts and bruises. That’s when he realized how lucky his father had been. After Short’s pre-storm call, his father had taken refuge in between a gun safe and a big freezer. “He was backed up to the safe, in between the safe and he's got one of those big deep freezes, big enough to put a moose in,’’ Short said. “It's a hundred years old. They probably don't even make them that big any more. Of course it was full of everything, deer, fish, you name it. It weighed probably more than the damn safe did. “There was about a three-foot gap in between and he was down in between those two things with a big couch cushion over his head. What you have to understand is he's in a corner of the house that has two rock walls. The safe was pushed back in that corner and bolted down to the floor. Somehow, Louie Short stayed with the deep freeze. And somehow he survived the crush of the rock wall. And somehow a six-foot steel safe bolted to the floor was gone. But that’s just the backstory to the interesting part of Louie Short’s luck. Friends and family poured out of the woodwork, doing whatever they could to help. They showed up as the Shorts began to sift through their lives, most of it scattered all over the ground. Personnel from Bass Cat Boats showed up with a trailer to store things in. Local anglers came with strong backs and willing hearts. Former Elite angler Ken Cook and his wife Tammie showed up with their RV and pitched in. Even though it was under terrible circumstances, it was a heart-warming scene. But as all those folks toiled and gathered, Louie Short was in a depressed state. He was happy to be alive, yes. And the home he lived in could be replaced, but there were things missing he couldn’t replace, possibly even do without. And all of them, prior to the storm, lived within the big, heavy safe that had somehow been blown away by the wind. Some have called it his life savings. The total isn’t important, but all of it together was weighing heavily on Louie Short’s mind. With most of the Short’s possessions that could be salvaged and found, Steve Howard, Short’s team partner in local bass tournaments, went home and returned with his bass boat. “He started poking around in the lake with his side imaging, looking for anything that was rectangular and hard like a safe,’’ Short said. “He found several things that might be it, but wasn’t sure. Meanwhile, Short went back to work sifting through the debris that was scattered everywhere. Steve Howard was indeed standing on the safe and it was partially covered with a big oak tree that had been deposited there by the storm. With the help of Short’s brothers, they were able to get a strap around it, hook it to a backhoe and drag it to shore. “When we got that safe drug up on the bank, and got it flipped over to where the door was up, put the key in it, spun the dial around to the right combination and popped that door open, there wasn't a happier 87-year-old man on the planet, at that point in time,’’ Short said, adding a well-deserved laugh at the memory of that moment. As for the rest of the Short’s things, they are stacked and piled in weatherproof containers or blown away probably to never be found. The area where they once lived, for a half mile on either side, there are no trees. 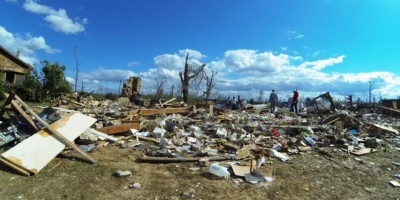 For more than a quarter of a mile there are no houses, just piles of debris. In the middle of all of that is a happy 87-year old man, thinking about taking a trip to the casino.